So here we have a brain whose association cortex works overtime to combine sensory information into a stream of relationships in space and time. In fact, you cannot shut off this process or stop the brain from constantly searching its sensory inputs for patterns, even when there are no patterns to be found! The time domain is particularly interesting because it is here that we build up the ideas of cause-and-effect and create various rules-of-thumb that help us predict the future, find food, and many other activities. This specific rule-type association largely takes place in the dominant hemisphere of the brain (left side for right-handed people) which also has the speech center. Specifically, the frontal lobes are generally considered to be the logic and reasoning centers of the brain. So when the brain is talking to you, it also has easy access to logical tools of thinking. We also have a minor hemisphere (right-side for right-handed people) that specializes in pattern recognition, but it contains no language centers and is therefore mute. 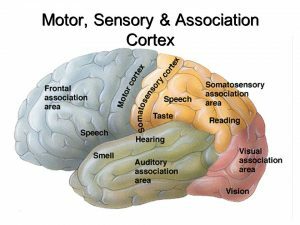 Its insights about the patterns that it finds in sensory data are totally overtaken by the constantly babbling left-hemisphere. All it can muster is that non-verbal feeling of ‘Eureka!’ you get once in a while. This sequence of brain scans shows the four stages of math problem solving from left to right: encoding (downloading), planning (strategizing), solving (performing the math), and responding (typing out an answer). Anyway, brain researchers have done brain imaging studies to explore where math reasoning occurs. They found that, when mathematicians think about advanced concepts, the prefrontal, parietal, and inferior temporal regions of the brain become very active. But this activity didn’t also happen in brain regions linked to words. This means, as many mathematicians can tell you, mathematics is not related to the brain’s language centers. It is an entirely different way of communication. In other words, you can carry-out mathematical thinking without an internal voice speaking. It is an entirely non-verbal activity until you are interested in communicating your results to someone else. I know this myself when I am solving complex equations. Not a single conscious word is involved. Instead, I move my hands, squirm in my chair, and robotically step through the methods of solving the equations without any verbal prattle like ‘Ok…this goes over here and that goes down here and x moves to the other side of the equals sign’ …and so on. I keep telling the public that math is the language of science, but in fact it is not really a language at all. It’s like saying that oil is the language of painting a work of art! In fact, when you are proficient at mathematics, you are behaving like a concert violinist who does not think about each note she plays, but flows along on a trained sequence of steps that she learned. Her sequence of fine motor skills are stored in the cerebellum, but a mathematician’s skills are stored in an entirely different part of the brain. 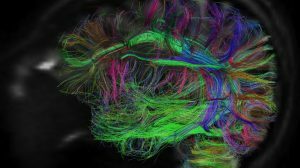 Researchers have found a group of a few million cells located in a region called the inferior temporal gyrus. These cells seem to respond very strongly when you are doing concrete, numerical calculations like balancing your bank account, filling out your taxes, or plugging-in numbers in a complex equation to get an answer . So the brain does have discrete regions and clumps of neutrons that make mathematical reasoning possible. An entire hemisphere is dedicated to ‘logical analysis’, but specific locations allow you to work with this implicit logic in an entirely symbolic manner that resembles the language centers in the Broca’s and Wernicke areas, which facilitate speech and writing words. So here we now have all the elements for creating a model of the outside world by using sensory data to find patterns in time, and to use these patterns to eventually deduce general mathematical If A then B logical statements about them that are entirely symbolic, and far more accurate than what the brain’s language centers can provide through its endless chatter. The basis for all these deductions about the world outside the brain is a concrete understanding of what space and time are all about. We learn about space through our binocular vision, but also because our mobility allows us to move through space. Even with perfect stereo vision, you have no idea what those objects are that you are looking at unless you can literally walk over to them and appreciate their actual sizes, textures and other features. So our deep, personal understanding of 3-dimensional space comes about because we have mobility and stereo vision. But actual vision as a sense may not be that important after all. Echolocation used by bats and dolphins is not a visual decomposition of the world but an auditory one, processed to give back a 3-dimensional model of the world without vision, color or even the perception of black and white being involved. Evidence from brain-imaging experiments indicates that, when blind people read Braille using touch, the sensory data is being sent to, and processed in, the visual cortex. Using touch, they get a sense of space and the relative locations of the raised dots that form Braille letters . Although the information is processed in the visual cortex, their impression is not a visual, but is instead a directly spatial one without the intermediary of vision to get them there! Next time I will begin the discussion about how astronomers and physicists ‘envision’ space itself. Check back here on Monday, December 12 for the next installment!